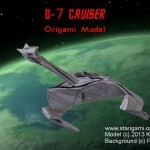 My first version of teh klingon buttle cruiser I have made in 2011. But I hesitated before publication of this. The approach was in broad terms clear. As with the Bird of Prey I use the bird-base. I would shape the nose by the same technique but flatter and wider in front and I would give the model instead of large wings, medium large but rather thick engine pods. The point was that I didn’t use any other picture or foto as reference but my memory. The model had found his fan pretty quickly and is not long in my possession. 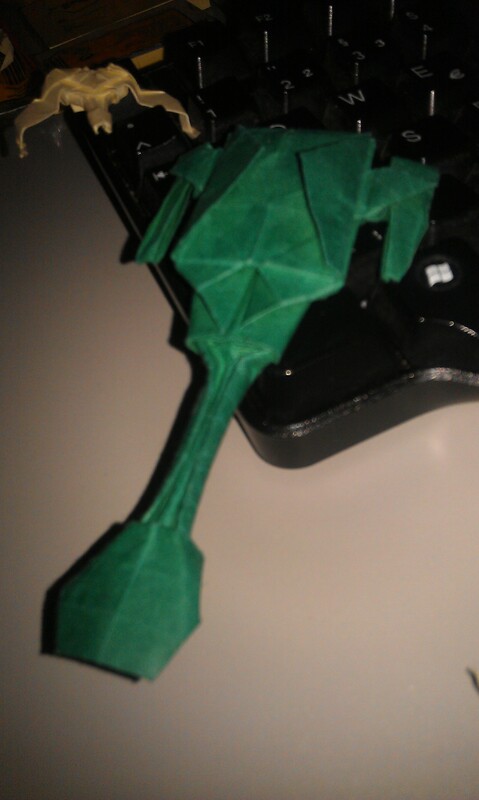 I was dissatisfied with this model. 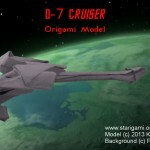 Because my only reference was my memory and imagination “how should this battle cruiser look like”. 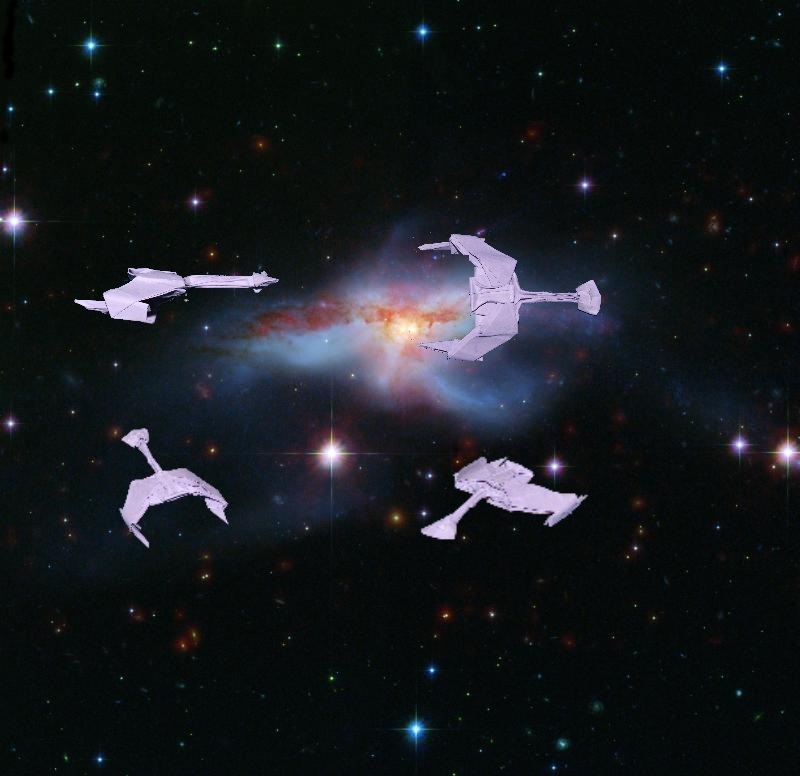 I’ve got something looking like a Klingon ship perhaps even like a Klingon cruiser but it was pretty distant from a D7 cruiser, that was in fact my goal. 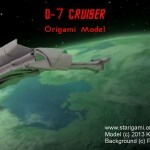 A crosscheck with images of the D7 cruiser shows me the main problem. These were the wings. My model missed them completely but a D7 should have two and in contrast to bird of prey these wings should be angled in the opposite direction. I experimented with the wings but without success. 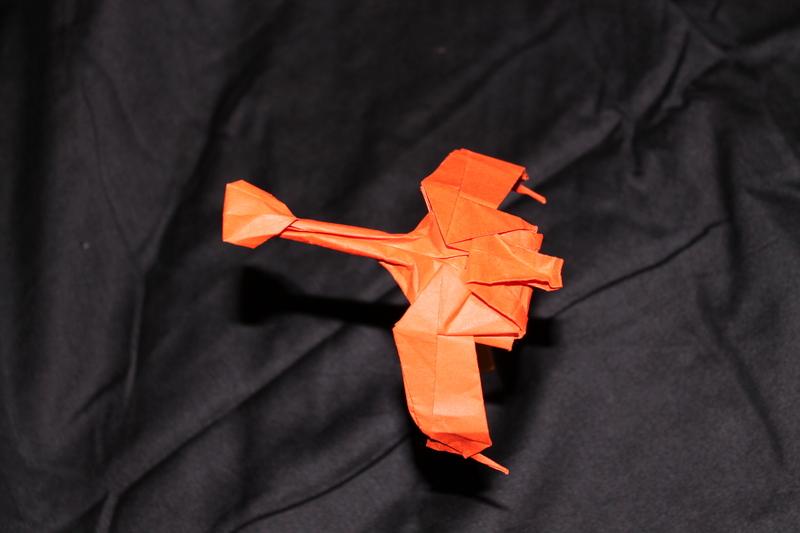 Several tries show me that either I have enough material to fold wings and pods but with wrong angle or I angle tehm in the right direction and have therefor not enough paper to shape wings with pods. I’ve began to doubt, if I had chosen the right base figure. The internet research brought two different models to surface. 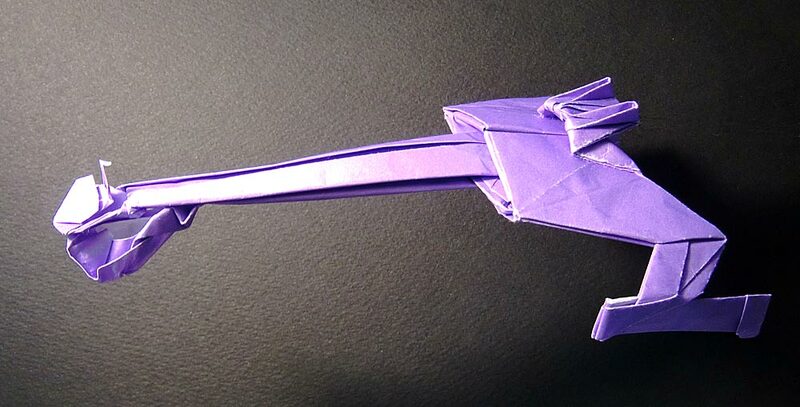 The one is from the Book “Star Trek – Paper Universe” by Andrew Pang” which I’ve found on Gilad’s origami page. Unfortunately is this book too expensive than I could afford it. The other is owned by Matayado-titi on Flickr. Near this photo I identified little parts of instruction. But my initial joy turned into disappointment. As I came across the little part of instruction, I saw the words “Glue or tape”. Due to restrictions I have set to me I’m avoiding such tools in developing of my models. But I saw that I was on the right way. Both models were obliviously developed from the bird-base. So I continued with my own developing. The problem, I was facing, was that ether I have enough material to create wings with the right pitch but not enough to shape the engine pods or I could shape engine pods but the Wings have wrong pitch or were missed completely. The Bird of Prey caught me by its shape. In particularly by that what I called front and rear. 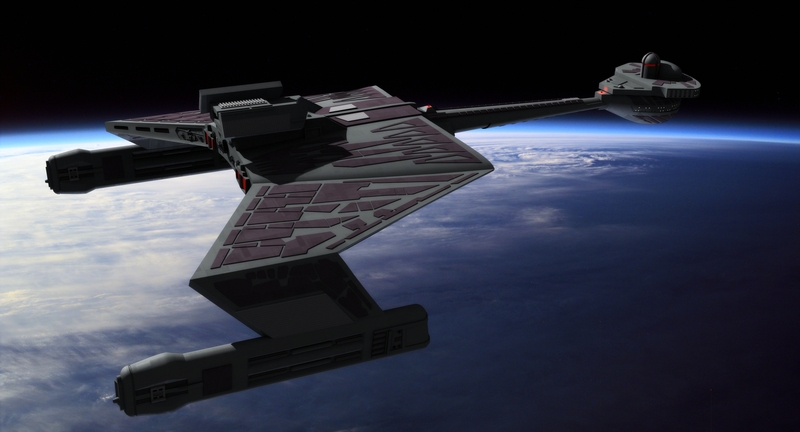 As I redefined front and rear by my model I could shape the wings like in Bird of Prey but they would be angled backwards because of the model orientation. 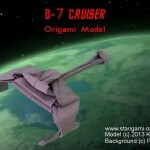 So I developed the first version of D7 that really looked like one. But with this model I still hesitated to go public. Something in the model was still wrong. So I started to look at the pictures of D7 again and again. I saw that neither have wings right pitch nor have engine pods right size and the rear of the model is too long. Suddenly I understood the Bird of Prey held me still in its shape. 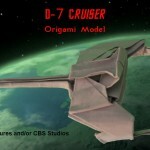 As I have liberated my mind from the Bird of Prey I was able to create my version of D7 that I want show you. It’s good you keep that policy. The “Glue or Tape” are not necessarily to use. You can finish it without glue in some way. 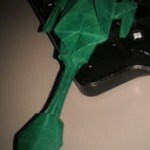 If I want finish them up the shape just like plastic models,they are effective methods I think. 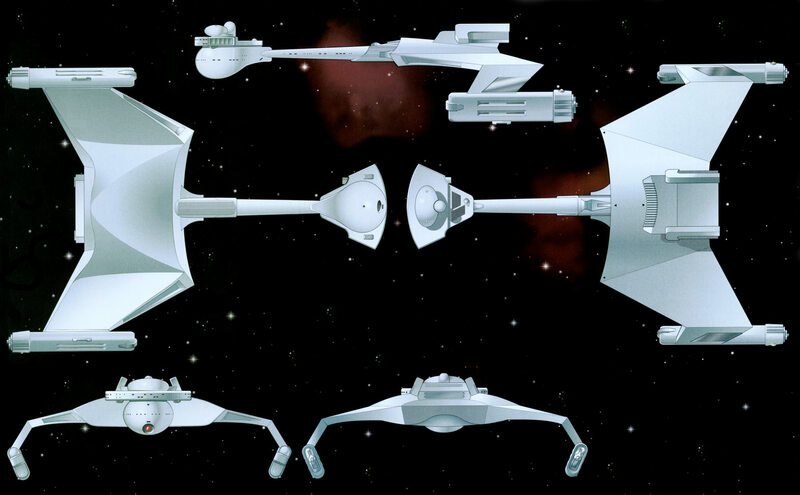 I had built 1.3m long Stardestroyer 33 years ago, I had used many many tapes and glues with her. That was so fun. Keep going on. I’m looking forward to you. 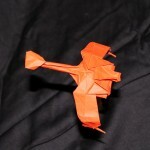 Most of my figures I develop and build from small pieces of paper like sales slip from cafeteria or postit. With this tiny size I realy do not need glue. Somtimes on modles, which do not want to keep in form, because more than four layers are to thick for such tyni creases I use natural glue that is already integrated in paper. I mean wet-folding. But this due to the lack of experience is still in experimental state. 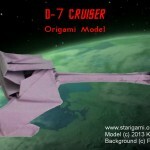 the biggest size of paper I ever used was square from A3 form which I’ve build the romulan Warbird.